Last weekend, on the monthly bird walk in Golden Gate Park (meets at the main gate of the Botanical Garden at 8 a.m. on the first Sunday of every month), my favorite sighting was four ravens lined up sociably on a branch high up in a Monterey cypress. It was a foggy morning, so all we could really see of them were ghostly silhouettes. I couldn’t tell whether their tails were v-shaped (ravens) or straight (crows), but our knowledgeable leader said they were ravens and I trust her completely. Later, at home, I got out my copy of Birds of Golden Gate Park (1930), by Joseph Maillard, and found that only crows were listed. In fact, Maillard noted that “only one large black bird can be mistaken for the crow, and that is the raven, of which none has been recorded from the Park.” Hmmmm. Times have changed! Check out an interesting post on the return of ravens to San Francisco, by Harry Fuller, who maintains the website TOWHEE.NET http://www.towhee.net/birdsf/ravens.html By the time that post was written (? ), ravens were definitely back in residence; the count in the city had surpassed 200. It seems likely that both crows and ravens were hunted out of the city in the nineteenth century (remember that Golden Gate Park had its very own hunter on staff, whose job was to rid the park of “pests?” https://fromthethicket.wordpress.com/2011/03/09/hunting-wild-animals-in-golden-gate-park-in-1905/). But by 1975, when Phil Frank began drawing his comic strip, “Farley,” ravens were again a fixture in the city. The strip, satirizing Bay Area culture and politics, featured Farley, a reporter for the local newspaper and his main sidekick was Bruce, a right-wing raven. Drawing of Bruce, the right-wing raven, by Phil Frank. 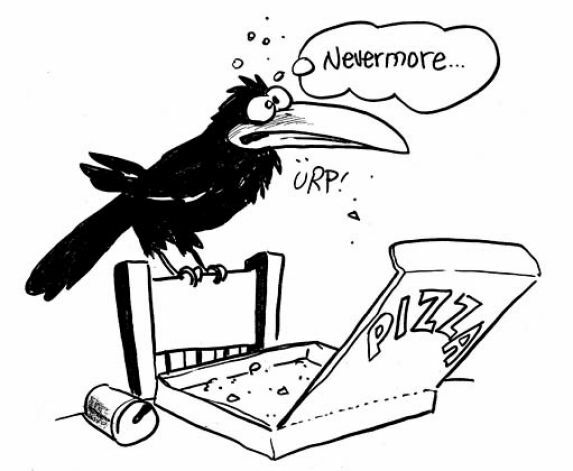 In fact both crows and ravens are thriving in Bay Area cities these days, perhaps because they don’t get shot at so much in cities, it’s nice and warm in urban heat islands and there are so many discarded pizza boxes to feast on. Now I’m wondering what diabolical scheme those four ravens were hatching on that branch in the Botanical Garden last Sunday?! Aside | This entry was posted in animals, birds, urban ecology, wildlife and tagged birds of golden gate park, golden gate park, golden gate park history, Ravens and crows, urban ecology, urban evolution, urban parks, urban wildlife. Bookmark the permalink. Love this post! Heath, your drawings are delightful. Love the raven sketch. And yes, both ravens and crows are expanding their ranges. Crows were rare birds in the Anza-Borrego Desert 20 years ago (see my book) and now are regulars. I think it is the reverse for ravens but don’t have the data in my head!